Musical numbers, the latest in fashion, and a live auction are just the highlights of the Phyllis' Musical Revue & Fashion Show. It's a charity event put together by Madonna Inn owner Phyllis Madonna, Cheri Humphrey (the inn's retail manager), and countless others. 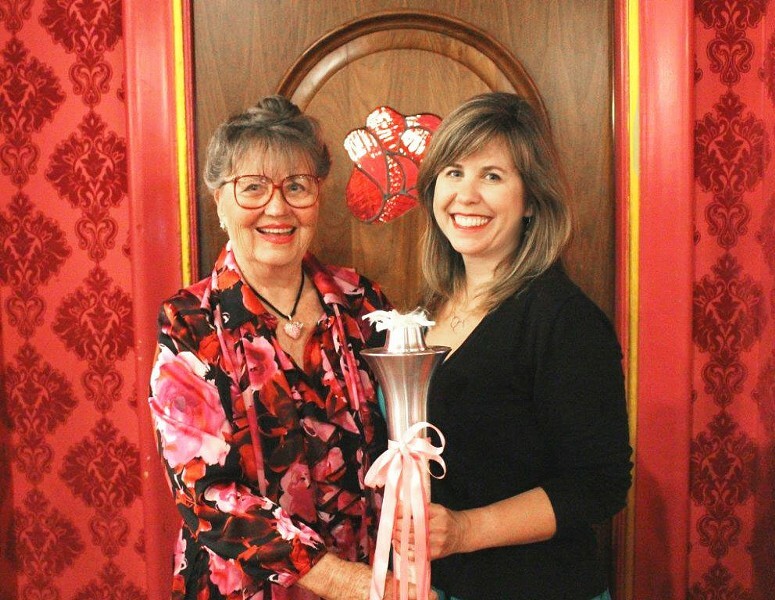 LEGACY Phyllis Madonna passes on the torch of her charity work to the Women's Shelter Program, which will continue the legacy of her musical fashion show charity event. For the past 30 years the proceeds have gone toward the Women's Shelter Program in San Luis Obispo County, an agency that provides services for victims of domestic violence and child abuse. This year's show (which was in March) marked the last that Madonna will have a hand and the last time that she'll take the stage, according to a press release. Executive Director of the shelter, Kirsten Rambo, said the charity event began in 1987, and it was a way for Madonna to work with the community to give back to the shelter. "She decided it's time for her to step down, and we totally understand; she's given us 30 wonderful years," Rambo said. "We're just grateful and appreciative for everything that she has done to bring this to life." As Madonna steps down, she passes on the reins of the charity event to the Women's Shelter Program, and in honor of the change, the theme of next year's event will be "passing of the torch." Rambo said that while Madonna will not be adding her personal touch to the production, it will still be produced with the help of Humphrey, who has been working with Madonna in past years' productions. "The show will continue to look quite similar, and we're so grateful to Cheri for that, as she continues to work with us," Rambo said. The community of volunteers, organizations, and talent is in full-force preparation for next year's extravaganza that will now be known as The Women's Shelter Program Musical Revue & Fashion Show. The shelter has established the Phyllis Madonna Legacy Fund to honor Madonna and her many years of work with this event. The legacy fund allows the community to pay tribute to Madonna's decades-long efforts by donating to the Women's Shelter Program in her name. "This is really just a way for us to continue to thank Mrs. Madonna for the vision she brought to life as well as all the work and effort she and the Madonna Inn family have put towards it," Rambo said. She said she hopes the fund will continue to boost morale and attendance for the event. For the last few years, the event's been bringing in about $250,000 for the Women's Shelter Program. The main source of funds for the shelter comes from grants, but the Madonna's charity event has become a large portion of the budget that goes directly to aiding clients. The event has given about 10 to 15 percent of the shelter's budget. The shelter uses the funds to provide services for its clients such as transitional housing, legal assistance, counseling, and a 24-hour crisis hotline (781-6400). Rambo said that this program is unique because it has an attorney who works pro bono to provide legal advice and representation for its clients. She said the shelter also has several units of transitional housing in San Luis Obispo and Grover Beach for its clients as they strive to rebuild their lives. Toni Detz, chair of next year's event, said she's been excitedly watching all the eager volunteers and community members come together for the cause. Along with the change of hands, Detz said that longtime attendees can still reserve their usual table, but tickets will now be sold online through the Eventbrite website. The event is set for March 2 and 3, 2018. For more information, contact wsptickets@gmail.com or call 316-1433. Staff Writer Karen Garcia wrote this week's Strokes & Plugs. Send tips to strokes@newtimesslo.com.